young leaves are edible raw, but sour. leaves are best when boiled in several changes of water. fruit can be winnowed to separate outer hull for collecting seeds. seeds can be boiled to mush, or ground into flour. seeds can be leeched in cold water before using as food. 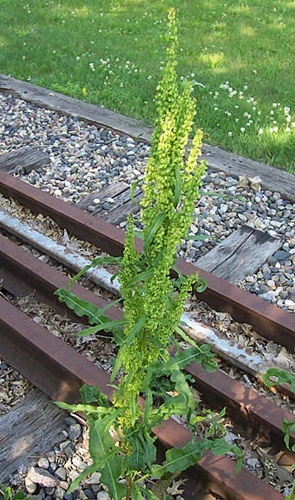 varieties in Ontario are Curled dock (Rumex crispus), Western dock (Rumex occidentalis) and Willow dock (Rumex triangulivalvis). grows in moist areas and disturbed sites in the plains, foothills, and montane regions. warning: raw plant is toxic in large quantity due to oxalates, which interferes with nutrient absorption.